Owls are solitary, mainly nocturnal bird of prey. 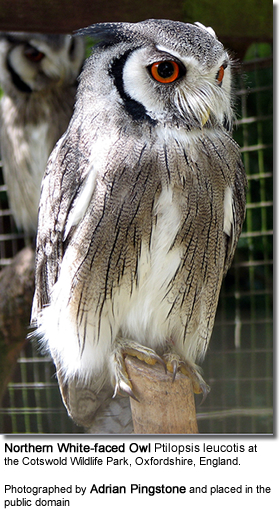 Owls belong to the order Strigiformes, in which there are 222 known species. Owls are classified in two families: the typical owls, Strigidae, and the barn owls, Tytonidae. The literary collective noun for a group of owls is a parliament. Owls are more closely related to the nightjars (Caprimulgiformes) than to the diurnal predators in the order Falconiformes. Some taxonomists place the nightjars in the same order as owls, as in the Sibley-Ahlquist taxonomy. Throughout history, owls were by many cultures feared and associated with evil and death. Some considered them to be "messengers of death," suggesting that if we spotted an owl or heard its calls, someone we knew was about to die. Most owls are nocturnal, but several, including the pygmy owls (Glaucidium), are crepuscular - hunting mainly at dawn and dusk. A few owls, such as the Burrowing Owl (Speotyto cunicularia) and the Short-eared Owl (Asio flammeus), are also active during the day. 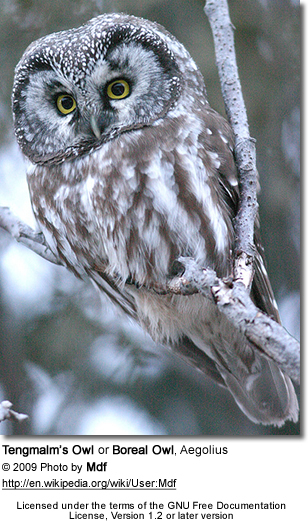 Owls with dark brown or black eyes are nocturnal hunters. Owls with yellow eyes mostly hunt during the day. Owls with orange eyes hunt at night and during the day. They are found on all regions of the Earth except Antarctica, most of Greenland, and some remote islands. 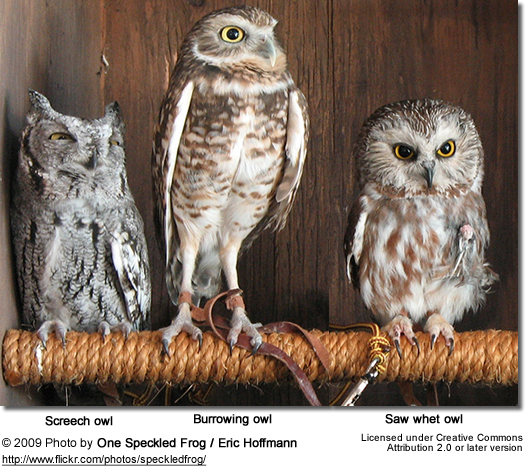 The smallest owls include the pygmy owls, some of which are only 5.1 inches (13 cm), have a 12.6-inch (32 cm) wingspan and weigh only 1.76 oz (50 g). The largest owls are the eagle owls, the Eurasian Eagle Owl Bubo bubo and Verreaux's Eagle Owl B. lacteus, which may reach 30 inches (76.2 cm) long, have a wingspan of just over 6.6 ft (2 m), and weigh about 9 lb (4 kg). Owls have a hawk-like beak, and usually a conspicuous circle of feathers around each eye called a facial disc. The facial disc helps to funnel the sound of prey to their ears. 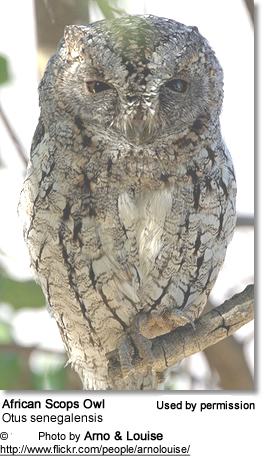 Additionally, the right ear is typically set higher in the skull and at a slightly different angle, and by tilting or turning the head until the sound is the same in each ear, an owl can pinpoint both the direction and the distance to the source of a sound. They have excellent hearing and exceptional vision in low light, allows them to hunt in total darkness. Their large forward-facing eyes are immobile within their sockets. For this reason, owls need flexible necks, as they have to turn the entire head to change views. They have the same number of vertebrae in their necks as most mammals and can move their heads 270 degrees in either direction (nearly all the way around!). Most other bird species have their eyes on the sides of their heads enabling them to see sideways and, to some extent, backwards. Owls, on the other hand, have both eyes in the front which enhances their depth perception. Owl nests are crudely built and placed in trees, caves, and underground burrows or barns. The typical clutch consists of 3 - 12 white eggs (depending on the species). 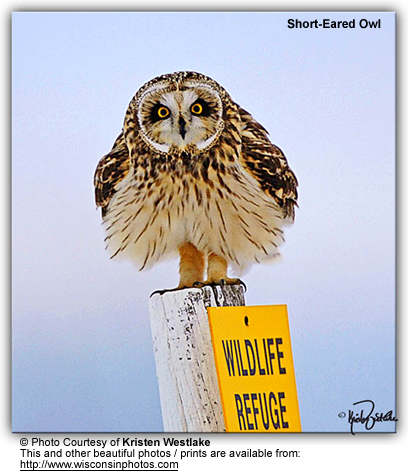 Owls mostly hunt small mammals, insects and other birds. A few species specialize in hunting fish. The hunting strategies differ by species. For example the Common Barn Owls generally capture prey in flight, and the Great Horned Owls usually hunt from perches and pounce on their prey on the ground. 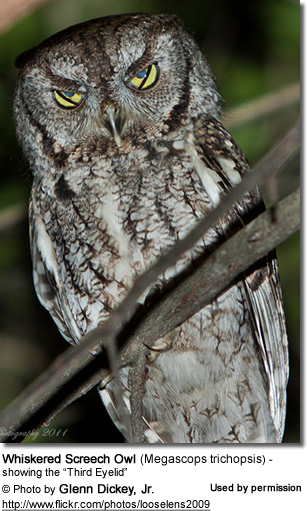 Many owls can hunt by sound in complete darkness, as the facial disc helps to funnel the sound of prey to their ears. Their muffled wings and dull feathers allow them to fly practically silent and unseen. Some fish-eating owls, which have no need of silence, lack this adaptation. Owls' powerful clawed feet and sharp beak enable them to tear their prey to pieces before eating, although most items are swallowed whole. Scientists studying the diets of owls are helped by their habit of disgorging the indigestible parts of their prey (bones, scales, fur, etc.) in the form of pellets. These "owl pellets" are often sold by companies to schools to be dissected by students as a lesson in biology and ecology, because they are plentiful and easy to interpret. Ancient Egyptians used a representation of an owl for their hieroglyph for the sound m, although they would often draw this hieroglyph with its legs broken to keep this bird of prey from coming to life. In the culture of the Native Americans, (e.g. 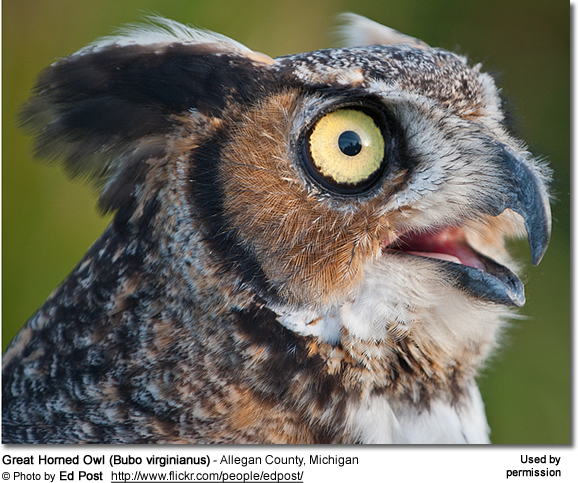 the Native American Hopi nation), taboos often surround owls and they are often associated with evil or sorcery. Like eagle feathers, the possession of owl feathers as religious objects is regulated by federal law (e.g. The Migratory Bird Treaty Act of 1918 and Title 50 Part 22 Code of Federal Regulations). The Aztecs and Mayans, along with other natives of Mesoamerica, considered the Owl a symbol of death and destruction. In fact, the Aztec god of death, Mictlantecuhtli, was often depicted with owls.There is a saying in Spanish that still exists today: cuando el tecolote canta, el indio se muere ("when the owl cries/sings, the Indian dies"). In Japanese culture, owls are seen as either negative or positive symbols depending on species. 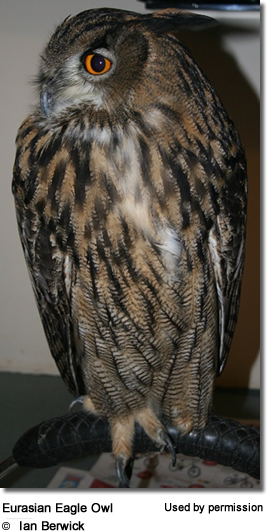 Eagle Owls are seen as divine messengers of the gods while Barn or Horned owls are perceived as demonic figures. In the ancient region of Akkadia (located in present-day Iraq), the demoness Lilith is thought to have been associated with(screech) owls as well. However, prior to the rise of Islam, owls were considered evil omens and bad luck in most Middle Eastern pagan traditions. In modern times, although such superstitions are less prevalent, owls are still popularly considered "evil" because of their fierce, horrific appearance. In Greek mythology, the owl, and specifically the Little Owl, was often associated with the Greek goddess Athena, a bird goddess who often assumed the form of an owl. Athena was also the goddess of wisdom, the Arts, and skills, and as a result, owls also became symbols of teaching and of institutions of learning, being included in the crest of arms of many universities. In the Western world, owls continue to be traditionally associated with wisdom. They are the unofficial mascot of the high-IQ society Mensa. The Romans, in addition to having borrowed the Greek associations of the owl, also considered owls to be funerary birds, due to their nocturnal activity and often having their nests in inaccessible places. As a result, seeing an owl in the daytime was considered a bad omen. The vampiric strix of Roman mythology was in part based on the owl.